Good News!—There IS a Right Weight-Loss Plan for You and YOU Alone! For decades, people have chosen diets based on what worked for someone else—some celebrity they admire, a coworker, or friend. Calm your kind of crazy--without the milkshakes! Forget any ideas you've had about how you're "supposed" to lose weight. The Right Fit Formula shows you how to fuel your aspirations and reach your goals that don’t involve landing on some magic number on the scale. With personality-driven recipes, food plans, and workouts, you learn to live your best, fittest, and healthiest life, not someone else’s idea of perfection. Let Christine show you how easy it is to live your life, and lose weight, too! 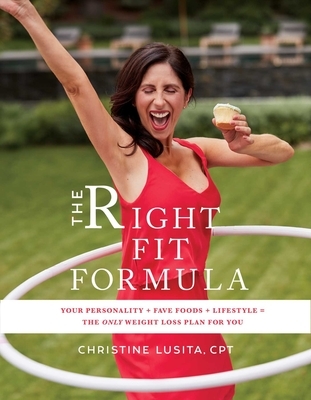 Christine Lusita is a Celebrity Fitness and Diet Expert, Weight Loss Coach, and Strength Maker. She's a nationally Certified Nutritional Counselor, Personal Trainer with NASM, Mindfulness Educator through UCLA, Behavior Change Specialist and a regular TV Lifestyle Contributor to national morning news. Her recent appearances include The Today Show, EXTRA TV, Steve Harvey, Inside Edition, ABC News and CBS. Christine resides in Los Angeles, California. "I love that Christine, who I have worked with for years, has included all of the critical elements for a balanced lifestyle—physical activity, behavior change including stress reduction, food plans with recipes, and attention to sleep. Kudos for a life altering plan." —Dr. Robert Huizenga, MD, Internist and Associate Professor of Clinical Medicine at UCLA; author of Where Did All the Fat Go? The WOW! Prescription to Reach Your Ideal Weight—and Stay There!